This used to be a narrow shoulder. Then they paved it and made it a wider shoulder, which served as a wonderful bike lane. I posted the question on Facebook; the consensus is that the rumble-stripped the road because people driving cars keep running off the road. The driver who ended up in our yard actually passed two breathalyzers. She was sober, there was no bad weather, it was light out, nothing in the road. We assume she was looking at her phone as it was in her hand when my husband got to her car seconds after she crashed. She had two fence posts go through her windshield on either side of her head. She was lucky to have nothing more than a couple gashes. She went through two back fences, took out several mature trees, missed our kids play structure by literally inches, and broke through our side fence, stopping feet from our neighbor who was unloading groceries in her driveway. That same neighbor had a car go through their yard a few months earlier. So we and several others on our street have been begging VDOT for a guardrail since this happened and they have repeatedly shot it down as too dangerous for the drivers. We also asked them to lower the speed limit to match the section of 240 near Western Ridge and they refused to do that as well. 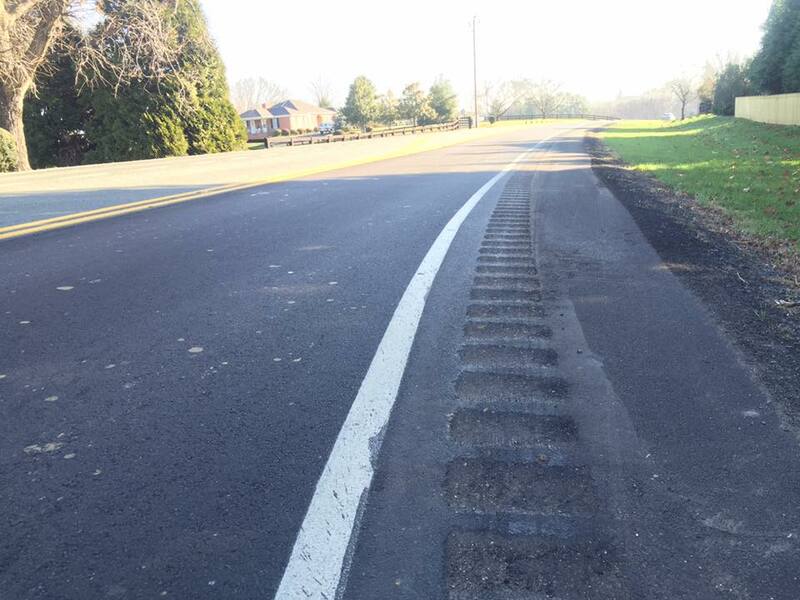 What they did do is pave the shoulder (because the drop off was soft and didn’t allow drivers the opportunity to self-correct) and put in the rumble strips. We told them it was not enough but after 11 months of asking that was what we were given. Anne Mallek even spoke up for us and they didn’t budge.That being said, I would urge anyone who is unhappy with this situation to call VDOT and tell them! There are houses on our street where the drop off from 240 is very steep and any car going off the road would be in their living room in seconds. People regularly drive too fast and we have spent many nights watching them swerve in and out of the lane lines for no apparent reason. So we are not giving up. If you’re willing to help, you can reach our Charlottesville Residency Administrator at VDOT at 434-422-9373. Express your safety concerns/unhappiness with not having a bike lane/frustration with wasteful spending… If enough people speak up maybe they will reconsider. We won’t get what we don’t ask for. Thanks! 1 – Focusing on building roads solely for cars is profoundly short-sighted and irresponsible, especially for a community seeking to encourage people to ride bicycles and to walk places. 2 – Maybe not building neighborhoods so close to a busy and getting-busier road? Video of the rumble-strip here. killing the driver. It is not unusual to see a vehicle that has driven over or through one. not appear to me that many share your concerns… Good luck with it though. I understand Highland homeowners concerns and don’t understand how guardrails endanger a driver on a road with a 45 MPH speed limit. The community got guardrails further east of this spot, where 240 goes down the hill. It seems like this section has both a hill and other humans outside the car that could be injured by car departing the roadway. I think we should continue to lobby for a guardrail and paving over the rumble strip, so it’s a bike-able pathway again. I also think we need to teach how to handle your car when you leave the road, you DON”T turn back – you drive straight, slow down, get control, then return to roadway. It’s worth EVERYONE practicing this – first at slow speed -10-20 mph – then faster as you gain practice with the technique. Pick gravel shoulders that have a wide margin past them. One day it may save your life. A valued and wonderful community member died last week because of failure to handle running off the road safely. I had a friend die a more than a decade ago on 250 near Ivy in similar circumstances. You can’t know all the details, but running off the shoulder of a roadway should never be fatal. It’s the over-correcting, followed by loss of control that creates the crash. and render an opinion but, that is about it. And really, Did I miss an election?